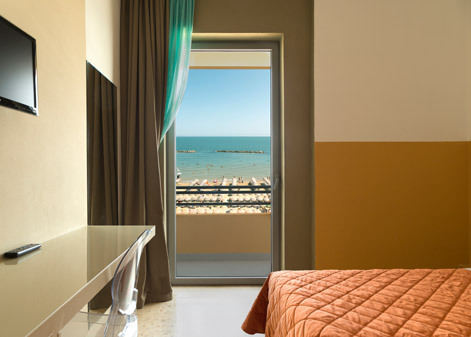 At Hotel Delle Nazioni Pesaro, thanks to its sea-view rooms, you open the window and the blue reaches the eyes and the soul. In our rooms there is plenty of space for everyone you care about. Your children can sleep peacefully in the Family room with spacious bunk beds that during the day turn into a handy sofa or in the Comfort room, large and with the possibility of adding beds. 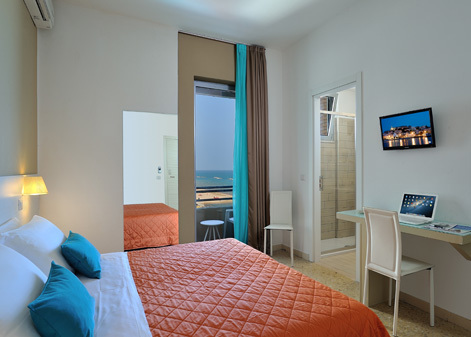 All the rooms in Hotel delle Nazioni Pesaro are characterized by very bright and cozy spaces. a smart and neat style. All bathrooms are new with spacious glass shower and hairdryer fixed to the wall. and then lie down and rest. 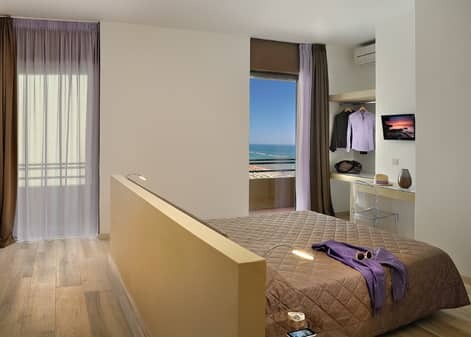 All rooms have a balcony with wonderful sea view and a large window which makes them particularly bright. Moreover, private bathroom with large glass shower box and hairdryer, free Wi-Fi, satellite TV, telephone, mini-fridge and safety box. I want to receive exclusive offers! Do il consenso a ricevere materiale informativo tramite newsletter.